I'm lucky I went to London this year, but even luckier I went to Cleveland twice. Positively Cleveland: there's your pull-quote for the next map. However, this does mean I get to experience Cleveland in less than ideal weather conditions. My first trip to Cleveland was mostly beautiful, while the second trip saw some cold weather. The third trip, which allowed me to give a stranger my Bike to Work Month Challenge bike, had some rain the day I was at the Cleveland Zoo, but I still got a long ride in the sunshine. This trip, made just before Thanksgiving, wasn't terribly cold but it rained often. London often. The set from 'Se7en' often. It was a the kind of rain that, when you're not accumulating yawns or napping, puts cyclists in ponchos that make them look like Elliot and E.T. all rolled into one. But I knew about the rain ahead of time and planned accordingly. As a cyclist, the first thing you should plan on doing when you get to Cleveland and find it is gross outside is to ride anyway. You all recognize South Norwalk, which I recently outfitted with new, tougher rims and a coaster brake. Here it is outside of the West Side Market, and it was one of the two bikes I brought with me on the long drive. Upon arrival, we checked in at the Aloft Hotel, a place I've stayed at before and will again. The coffee is good, the staff is very friendly, and there are at least a couple of great restaurants on the same block. However, the Aloft does have a few design quirks we don't care for. For instance, my wife, who is 4' 6" tall and a Starwood Preferred Guest member, has to contend with the following. So Starwood: if you can move the closet hooks closer to the floor - and possibly team up with Park Tool to offer a 'Cyclist's Suite' featuring access to tools and a Deluxe Wall Mount Repair Stand set up near the TV - you'll have some exceptionally happy guests on your hands. But anyway: back to Cleveland in the rain. 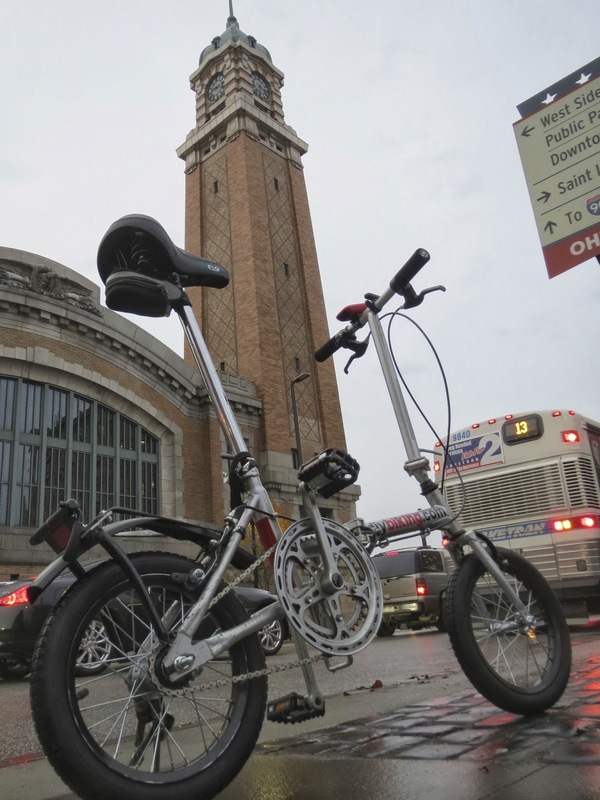 So, I had South Norwalk, a folding bike so small it can be easily brought into a fine establishment, such as Erie Island Coffee Co. on East 4th street - just across from the outstanding Greenhouse Tavern. Sitting in a good shop sipping coffee is a great thing to do on a rainy day. On this trip I also swung by The Bike Rack, which is the bicycle parking, locker and shower facility I covered on an earlier Cleveland trip. I got to see their Christmas tree going up and learn that it is busier than ever with 65 regular members. Pay attention, Stamford. Look at me when I'm talking to you. 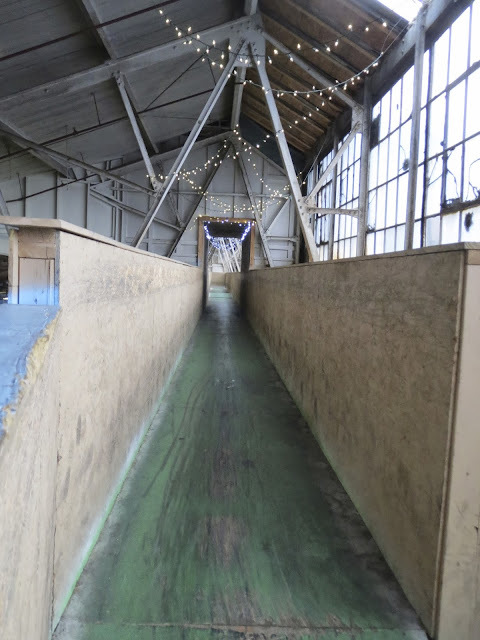 Another good thing to do in Cleveland - whether it is raining or not - is to plan your visit to the Ohio City Bicycle Co-Op, which I had the pleasure of volunteering at last summer. The first thing I did, which was during hours the Co-Op wasn't open, is plan my route since I wanted to know of any dangers or challenges while it was still daylight. Lucky for me, the work-in-progress that is Cleveland smiled on me: if you recall, last summer I had a bone-jarring ride on the road that leads to the Co-Op since it was under construction. That's what the road looked like this past summer. Below is what it looks like now. It nearly brought a tear to my eye: smooth pavement and sharrows as far as the eye can see. You're not lookin' at me, Stamford! Anyway, I was disappointed to realize my schedule wouldn't allow volunteer time at the Co-Op, but the day before setting off from Connecticut, I learned of the Bike Art and Fashion Expo the Ohio City Bicycle Co-Op was running on December 7th. Of course, I wouldn't be there for the show on December 7th, but I did have a chance to submit artwork. Limited to what I had on hand and could fit in the car, I brought along two things, which I was able to fit in an IKEA bag sealed with duct tape to protect them from the rain. Photo paper, tools and time. 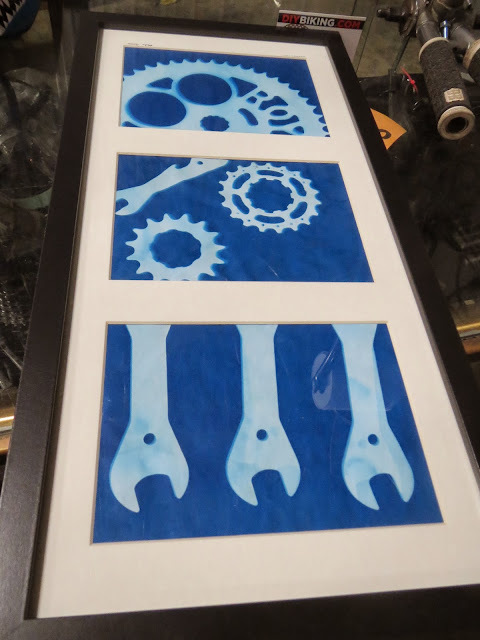 I think I named it "Bike Tool Selfie" or something along those lines (I created it but since it was just something I hung in my home office it didn't occur to me to give it a name until I dropped it off). The next submission made the guy behind the counter at the Co-Op grin widely and take a picture with his own cell phone camera. Now I snuck a picture of this in during DIYBIKING.COM's Cargo Bike Salute, which occurred after I carried 30 rolls of toilet paper on a cargo bike I welded myself. I had created this out of bits left over from the Fuji Espree - the parts that weren't used for the bigger welding project - and assembled it in such a way that welding wasn't involved. A share of the proceeds from the sale of these and the other submitted works go to a great cause - helping the Co-Op - so if you live in Cleveland or plan to be in the area, please visit The Ohio City Bicycle Co-Op Winter Bike-Art & Fashion show on December 7th. With that settled, I thanked the folks at the Co-op and returned to the hotel. The next day, with the rain still quite bothersome, I got into the car and headed off to Ray's Indoor Mountain Bike Park. Up to this point, I had only heard rumors and legend about Ray's. Now I had stopped by briefly during my second visit to Cleveland but was too tired from riding the recumbent to get my money's worth out of a day pass. Knowing I'd be back in Cleveland, I put it off for another visit. This time, I was rested, ready, and had brought my homemade mountain bike. Like everyone who wants to buy a pass (I purchased the weekday pass for a little over $20 and unfortunately am not in Cleveland enough to take advantage of the $349.99 season pass), I had to sign here, here, here, here, initial here, here, here and here before they let me sign the rest of the waivers. After that, I paid for my day pass and the pleasant person behind the counter handed me a map. In keeping with the tradition of DIYBIKING.COM, I didn't use the map the whole time. I was just too eager to head into the park. Now I was initially worried because I wasn't going to be able to stay more than a couple of hours on my day pass, but the first twenty minutes alone were worth the price. You just have the doomed X-Wing fighter moment when you say to yourself: 'look at the size of this place.' The unbelievable size of the building is pleasantly overwhelming and I spent most of my time on the yellow and green XC loops - just happily riding about in dry shorts and a dry jersey while the rain continued outside. And that's where things went wrong. Here's what happened: I didn't realize how tired I was until about a third of a second before I fell: riding too slowly, my front tire pitched off the left edge, sending my right side onto the track. Then I fell onto my left side. Lucky for me, my face broke my fall (no lasting damage but for days afterward I looked like I had been in a fight). I then put my finger on the dangerous thing about this park. It's not the trails - they are intelligently laid out - and it isn't the jumps or the expert course. It's that as a happy cyclist, you have no frame of reference about how long you've been riding and it isn't easy to know when to take a break. You're not looking at your watch, you can't see the sun move across the sky, you can't count mosquito bites and, since Garmin bike GPS devices are useless indoors, you have no idea how many miles you've gone. If you go to Ray's - or rather, when you go to Ray's - take frequent breaks. 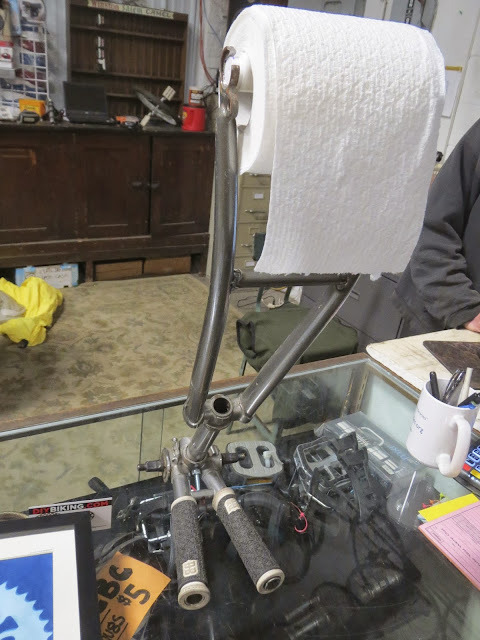 I was fortunate not to be badly hurt and the bike got through unscathed, so after more euphoric riding, I called it a day and headed back to the hotel - first stopping at Joy Machines to buy some titanium tire levers as a stocking stuffer for myself. The next morning was the Saturday before Thanksgiving - Food Bank Biking Day. 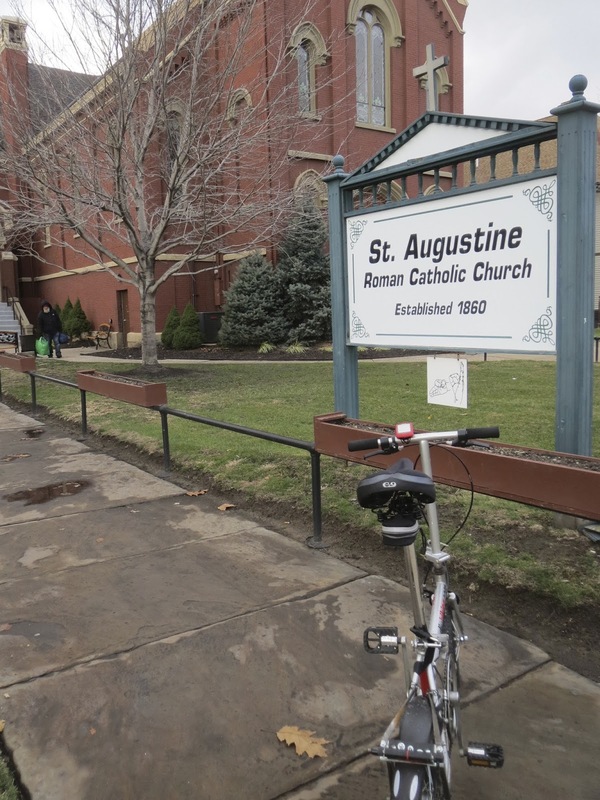 Unable to join my fellow cyclists in Stamford, I pedaled off on South Norwalk and loaded some non-perishable foods into my backpack before dropping it off at St. Augustine - which I had learned about that morning from Fox 8 Cleveland. I later found out eight cyclists in Stamford got together in the chilly weather to bring 47 pounds of food to the Food Bank of Lower Fairfield County. I was glad I had done what I had done in Cleveland but I did truly wish I could have been in two places at once. So in closing, if you are in Cleveland and it is raining outside, fear not. As a cyclist, there is still plenty of places for you to go and things for you to do. If you can't bring a mountain bike to Ray's you can always rent one. No matter your machine: take a lot of breaks. And visit/support the Ohio City Bicycle Co-Op and be sure to attend the Bike Art & Fashion Expo this Friday - and check out both my works and the works of people far more talented than me. And as a final note: today is Giving Tuesday, so a trip to a charity in Cleveland or to a place like Person-to-Person in Darien should be in order. Thanks for reading and thanks for riding.